Ahhh, springtime is finally here! The days are getting longer, the sun is out and I want to be spending as much time as I can doing things that matter most to me. Like spending time with my husband and kids. But I have to grocery shop, meal plan, and cook dinner for my family! Ugh, there is just never enough time. As a working mom (I’m an ER nurse) I already have a hard time coordinating everything I have on my do-to list. That is one of the many reasons Sun Basket meal delivery has been such a blessing for us. My husband and I started using Sun Basket three years ago when I was pregnant with my daughter. Since then I have introduced the meal delivery system to several other families who have found the same value in it that we have. Admittedly, I do not enjoy meal planning. And I have never thought of myself as a very good cook. Fortunately, with Sun Basket meal delivery I get simple recipes, organic nutrition, and an easy way to prepare a healthy meal in 3o minutes or less. If having scrumptious organic home cooked meals regularly without a ton of hassle is something that interests you too, please continue reading about the 9 reasons Sun Basket Meal Delivery has brought great value to our family. Sun Basket is a healthy meal kit service that delivers organic produce, clean ingredients and easy, delicious recipes for cooking at home. We have it delivered to our doorstep once a week and has completely revolutionized dinner at our house. I have almost zero extra time (isn’t that every Mom’s dilemma?). Bottom line: Sun Basket meal delivery has made it so much easier for me as a Mom to ensure that my family eats a healthy diet. In fact, I don’t know how I could feed my family this well without it. How does Sun Basket work? You sign up online and pick the recipe option to your liking (vegetarian, paleo, gluten free, family options). You can also select exactly which meals you want delivered. Then a box is delivered to your doorstep with every pre measured ingredient you need along with a detailed recipe. Simple and easy, just the way I like, er, need it! I have tried nearly every meal delivery system, yet I always come back to Sun Basket. I wont say which ones we have tried but you have probably heard of them. I stopped using them because on several occasions there was at least one ingredient that had already gone bad. Yuck! I just didn’t feel that I was getting the same quality that I did with Sun Basket. Healthy nutrition is so important to me. As a registered nurse I have spent a lot of time taking care of patients with preventable chronic illnesses. I am constantly trying to teach my patients how to take better care of themselves by eating well and getting enough physical activity. It is well documented that eating a nutrient rich diet is vital for good health, well being and even prevents many chronic illnesses from occurring in the first place. Good food provides our bodies with the energy, vitamins, fats and protein we need to thrive. We need to take more responsibility for their own health and well-being. The best way to prevent chronic illnesses and most cancers is to not get sick in the first place! Sun Basket delivers of ALL of the ingredients I need to make 3 dinners per week. That means I don’t have to spend time hauling my kids to the grocery store to buy food for those meals. I also love that our meals are already pre planned so I don’t have to figure out what I’m going to cook that night. Most importantly though, Sun Basket meals take 30 minutes or less to prepare with easy to follow recipes. Which means I get to spend more quality time doing things that I love, like playing with my little ones. You can get 50% off Sun Basket Family Meals HERE! Since I am getting only the meal ingredients I need, I don’t have to buy an entire block of Parmesan cheese (for example). Plus, ordering take-out or eating out can start to add up over time. I am a big fan of fresh, organic produce. I can even taste the difference between organic and conventional produce a lot of the time. That is why I appreciate that Sun Basket ingredients come directly from the source. There is nothing I hate worse then buying spinach from the grocery store and having it turn bad the next day! 100% of Sun Basket’s produce is organic and they only use responsibly raised meats free of antibiotics and added hormones. Also, Sun Basket uses sustainably sourced seafood that is listed as “Best Choice” or “Good Alternative” by the Monterey Bay aquarium’s seafood watch program. Last week I made Havana shrimp mojo tostadas with cabbage slaw. This meal was so good, I couldn’t believe I actually cooked it myself! The recipe was super easy to follow and looked, dare I say… fancy? Like, restaurant style fancy. I used to steer clear from seafood because I never felt comfortable cooking it. Now I make a different seafood recipe at least once or twice a week! There have been two times that our delivery was shipped 1 day late due to traffic issues in Los Angeles. Both times we were notified immediately and offered a credit if we decided not to accept the box. Not a deal breaker for me as the shipments did arrive fresh. LA traffic truly is off-the-charts insane so unfortunately its par for the course here. Other then those minor inconveniences the service has been exceptional. The most important benefit for us that has come out of using Sun Basket is that it allows us to sit down as a family for our meals, no excuses! Dinner is my favorite part of the day and I love that it gives my husband and I a chance to reconnect and talk about whats going on in our lives. It keeps us connected. Its like having a date night in. Sadly, for my husband and children, I am not a culinary genius. I’m not horrible in the kitchen, so long as the recipes are simple and easy. My specialties usually involve a Nutri bullet and just mixing ingredients in a bowl (what can I say, I like to keep things really simple!). Cooking has become a family experience for us. My daughter helps out by tearing greens, mixing dry ingredients in bowls, mashing veggies, and even dashing our meals with salt and other spices. It is a real treat to watch her get excited to cook! She is learning the value of cooking with healthy ingredients and we have a great opportunity to teach her where her food comes from (so she knows that food isn’t created in a grocery store). I am constantly learning about new ingredients and cooking techniques. And looking like an expert chef to boot! Sun Basket discount for first timers! Tonight we are having lemon-pepper salmon over Greek salad with artichokes and olives. My recipe says it will take 20 minutes to prepare and I know I have every ingredient I need, so I am not stressed about it. Its Saturday evening and I am looking forward to enjoying a wonderful, nutritious meal with my family on the back porch… with a nice glass of wine of course. Join us for dinner anytime! 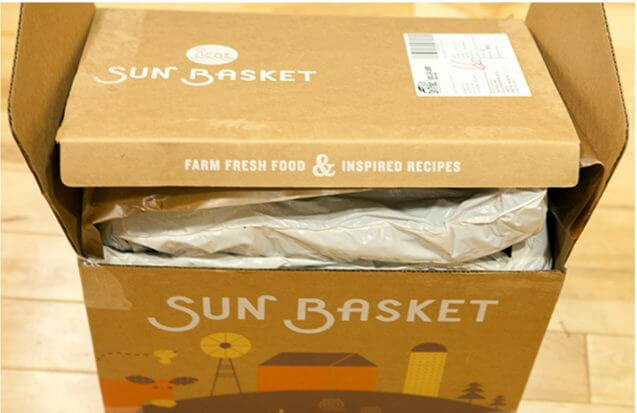 Just read your excellent review of Sun Basket…We are definitely going to try it! Love all of your posts! This meal looks delicious. 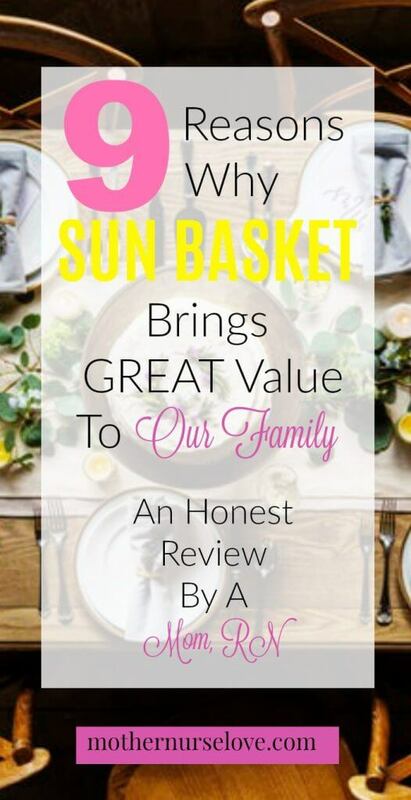 Can’t wait to try SunBasket with my family!